This is a premium quality, 100% cotton, pre shrunk, machine washable, short sleeve childrens t-shirt which is hand made to order. We use the finest quality clothing vinyl to create a vibrant print which will not crack or fade like other methods such as screen printing and transfer printing. We have used our years of experience to provide you with a high quality product which will not be matched at this price point. Available in sizes 3-4yrs, 5-6yrs, 7-8yrs, 9-11 yrs, 12-13yrs. This design is also available on unisex t-shirts, womens fitted t-shirts, hoodies, jumpers and baby vests. Please click HippoWarehouse to browse all our items. 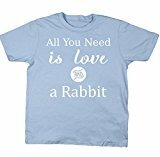 This entry was posted in Small Animals and tagged HippoWarehouse, Kids, Love, Need, RABBIT, Short, Sleeve, Tshirt by One Boutique. Bookmark the permalink.